Puzzling over what to do with materials. Alan Balicki supervises, far right. 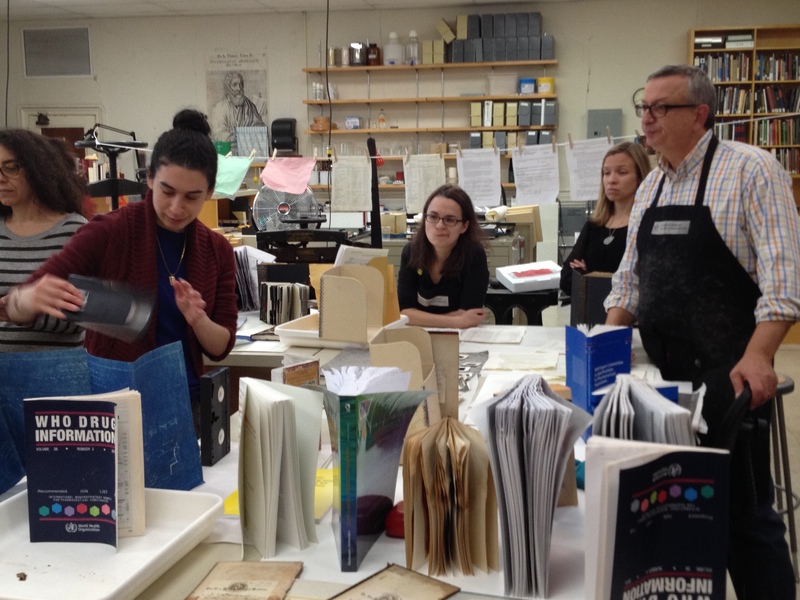 On December 11, Alan Balicki, chief conservator at the New York Historical Society, came to NYAM’s Gladys Brooks Book & Paper Conservation Laboratory to lead an afternoon workshop about the importance of disaster planning, response, and recovery. The Conservation Lab recently rolled out a comprehensive Collections Disaster Plan detailing the proper protocols for dealing with disasters and Alan’s workshop was a great way to cap off this project. 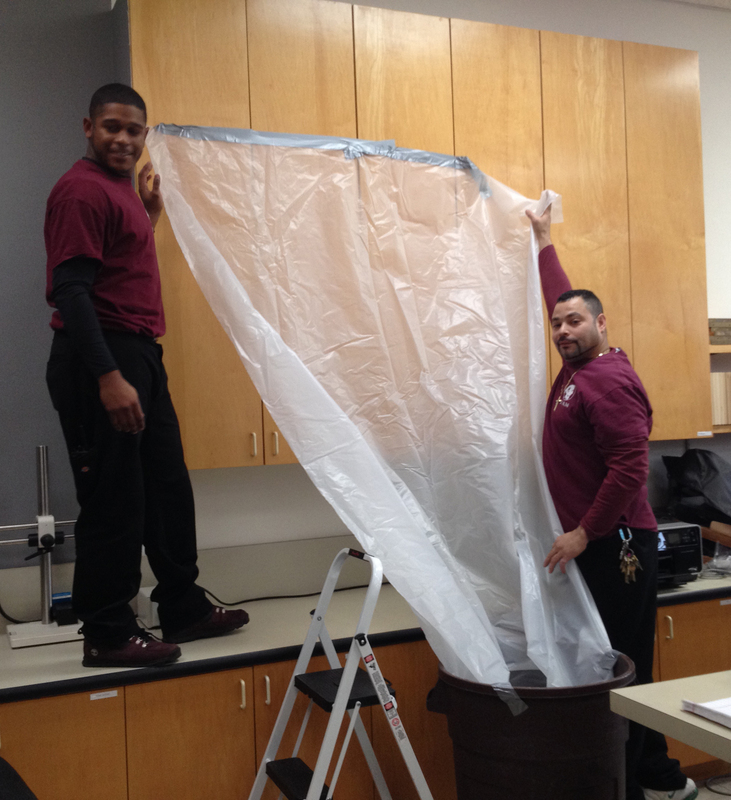 Facilities staff experiment with draping techniques to protect against a leak. The most common risk that libraries face is flooding due to pipe leaks or severe weather conditions. All the staff from Center for the History of Medicine and Public Health as well as several members from the Facilities Department had the opportunity to see what happens when materials get wet (all items used were set to be discarded). Center staff members were also able to engage in hands-on experimentation on how to dry different items based on their materiality and to ask questions in a non-disaster setting. Staff were encouraged to return to the lab the next day to see how the items had dried and engage in conversation about best practices. 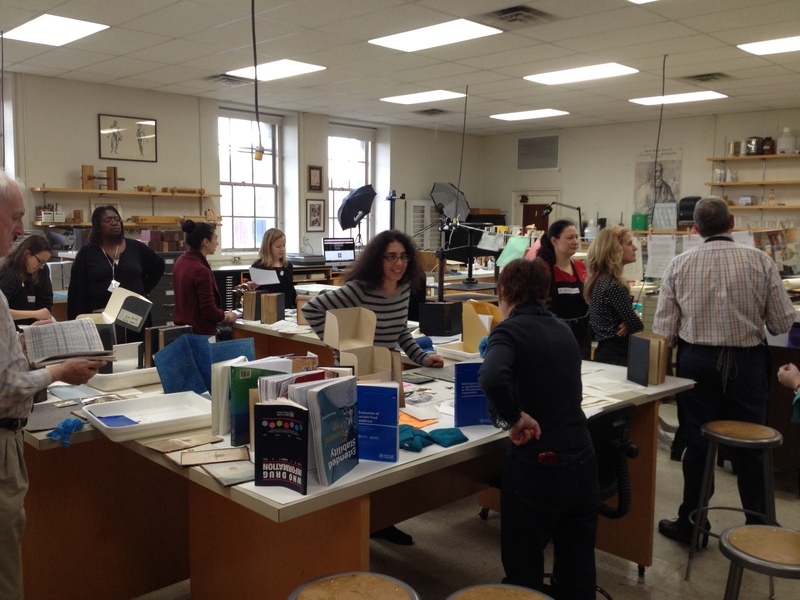 We experimented with a variety of materials, including coated paper, leather covers, colored paper, shrink wrapped materials, photographs, audio-visual materials, and blueprints. Staff practiced interleaving soaked books, draping with plastic, and basic techniques for dealing with wet and fragile materials. Workshop participants dried materials using best practices (fanning and interleaving) as well as unorthodox methods (keeping the materials wet and closed) in order to compare the results. 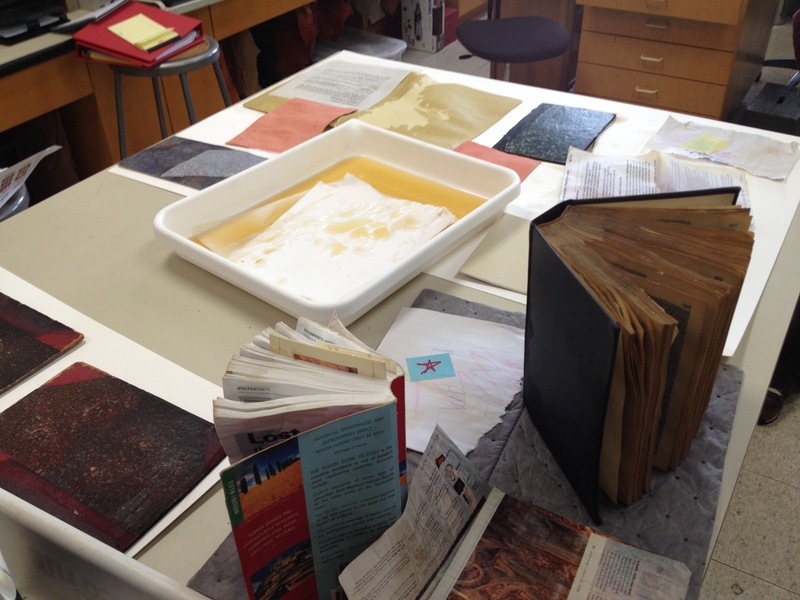 It was very instructive to witness how thoroughly books soaked up surrounding water, and how quickly coated paper began to “block,” or stick together, when wet. It was not surprising that some colored papers and Post-it notes bleed when wet, but seeing how quickly and dramatically they reacted to water was a good cautionary lesson. Conversely, it was encouraging to see how effectively shrink wrapping protected items from water. 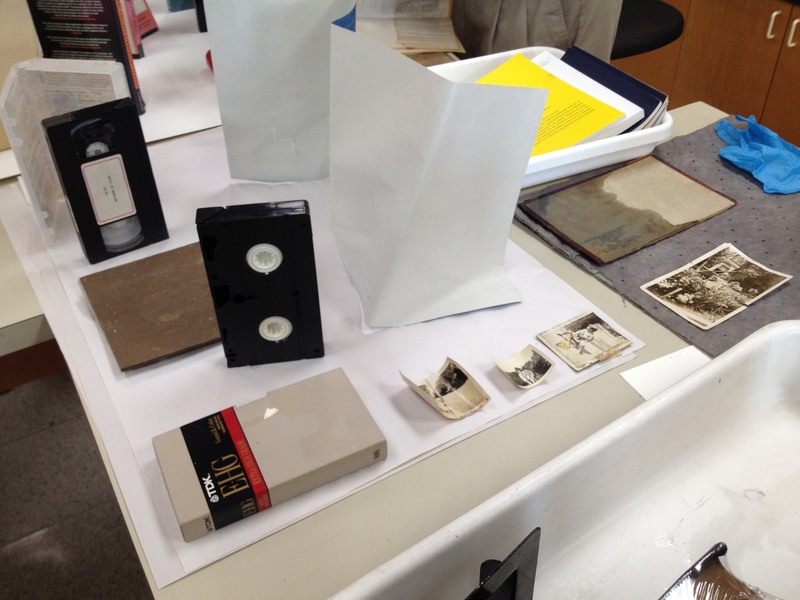 Paper, cloth, and leather materials. Alan gave a thoughtful presentation on real-world dangers faced by libraries, and impressed the group with his capable and pragmatic approach to disaster planning. Thanks to everybody for a great learning experience, and especially to Alan for his time and expertise. This entry was posted in Collections, Conservation and tagged collections care, disaster plan, disaster preparedness, disaster recovery, disaster response, libraries by nyamhistorymed. Bookmark the permalink.